One of the most fascinating components of the esports industry is the willingness of spectators to pay their favorite players while they are watching them compete. It has created an immense opportunity for “streamers” to earn significant revenue beyond what advertisers may be willing to pay them for product placement and/or shout outs. These payments are essentially esports donations, and they are being made at a rapid pace. If you log in to a streaming service like Twitch, you will instantly start seeing esports donations made by the minute, with streamers constantly thanking their fans in return. But just how lucrative can it be for a streamer? The average individual who is donating to esports streamers is spending approximately $465 per year on such donations. 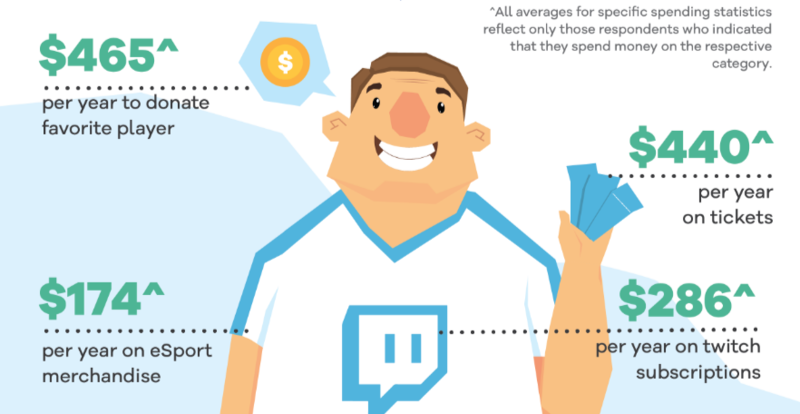 Of the 62% of esports fans who have spent money in the space, 50% of them have made a donation to their favorite esports professional gamers that stream through a service like Twitch. The aforesaid statistics are provided by LendEDU, which just completed a survey of 1,000 self-identified esports fans to learn about their spending habits, from the aforesaid donation activity to the amount spent on merchandise to parental payments for their childrens’ video game lessons. It is a very interesting concept that only appears to keep growing. Providing these esports donations to streamers, or “tipping,” went from roughly $44 million in 2015 to $80 million in 2016, and the number of channels that earned at least $10,000 from donations almost doubled during that same span.